HARTFORD, Conn. - UConn freshman Ruslan Iskhakov (Moscow, Russia) scored a pair of goals and added an assist but a third period rally came up short for the Huskies, falling 5-3 to Boston College at the XL Center Friday night. The Huskies fall to 7-17-2 overall and 2-12-2 in Hockey East with the loss. The Eagles move to 9-12-3 overall and 9-4-3 in the league. The Eagles won the battle on special teams with a pair of power play goals and built a 4-1 lead into the third period. The Huskies began to rally with Iskhakov's second on the night just 1:06 in the third to cut the lead in half. UConn junior Wyatt Newpower (Hugo, Minn.) pulled the Huskies to within 4-3 at the 6:14 mark, blasting a one-timer home on the power play. The Huskies kept pushing and outshot the Eagles 14-6 in the third period but couldn't find the tying goal with BC taking on an empty netter in the closing minute. The Eagles got a goal and two assists from both Ben Finkelstein and Jack McBain in the win. Oliver Wahlstrom and Ron Greco added the other BC goals. The Huskies ended the night with a 30-26 shot advantage. BC goaltender Joe Woll stopped 27 shots to collect the win. BC carried a 1-0 lead into the first break thanks to Wahlstrom's eighth goal on the season. The rookie collected a pass from McBain in the high slot and snipped one past Huska for the period's only goal. The Eagles took advantage on special teams in the second, scoring twice on the power play. 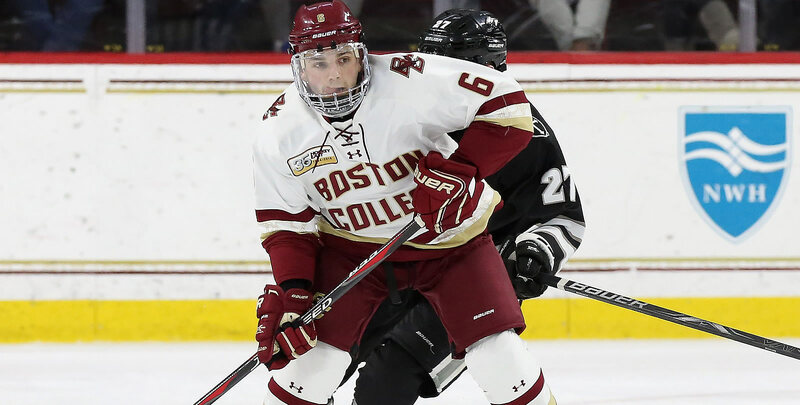 BC went up 2-0 at 5:06, scoring just once on a five-minute power play as Carter Turnbull (Nanaimo, British Columbia) was disqualified for checking from behind. BC's McBain redirected a pass from Finkelstein in front of Huska, his fifth on the season. The Huskies cut into the lead at 8:40 as Iskhakov scored his first of the night. The freshman fired off a feed from Max Kalter (Highland Park, Ill.) and then knocked in his own rebound to make it 2-1 BC. BC pushed their lead back to two goals at 14:33 as Greco stuffed home a rebound at the right post. The shot came from out high from Zach Walker with Huska making the stop. The loose puck found Greco who snuck it just past Huska at the post for his first on the season. The Eagles got a 5-on-3 chance late in the period and took a three goal lead thanks to a Finkelstein goal at 17:55. The junior defenseman took a shot from the slot, collected his own rebound and then buried it for his first of the year and a 4-1 lead. The Huskies went to freshman goaltender Tomas Vomacka (Trutnov, Czech Republic) to start the third period then struck quick to kick-start a rally. Iskhakov burst up the middle on a give-and-go with Kalter and rifled a shot past Woll from the right wing for his second of the night and his fourth on the season. It was Iskhakov's first multi-goal goal game of his career. The Huskies got a 5-on-3 chance at 5:19 and took advantage at 6:14 as Newpower blasted a one-timer off a cross-ice feed from freshman Jonny Evans (North Delta, British Columbia) to notch his second on the year and pull UConn to within 4-3. UConn got another power play chance at 16:45 but BC killed it off and then pulled the goalie in the closing two minutes for the extra skater. The Huskies couldn't find the tying goal and BC's Aapeli Rasanen put in an empty net goal to seal the win. The Huskies are back at home in XL Center on Thursday, February 7 when they play host to the Northeastern Huskies.